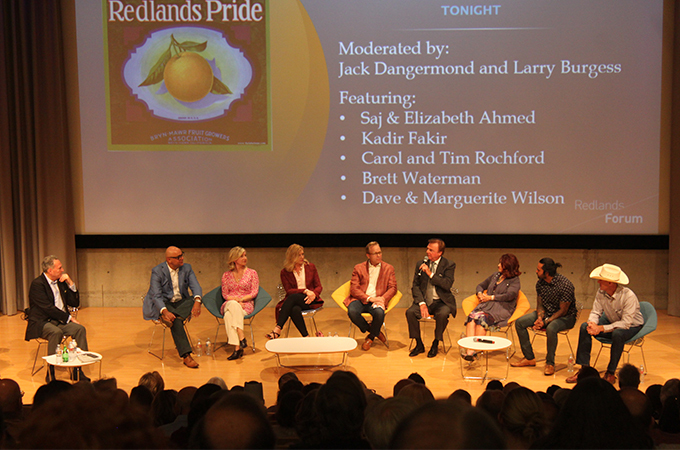 A panel comprised of recent arrivals and products of multigenerational Redlands families emphasized Redlands’ strong sense of community and rich history, while also commenting on what could be done better. Moderated by Jack Dangermond, president of Esri, and Larry Burgess '67, historian and director emeritus of A. K. Smiley Public Library, the event resonated with a sense of civic pride. Here are some of the perspectives expressed. Remarks were edited for brevity and clarity. “It’s our duty to save some of the land we have, some of the orange groves, trees, rivers, and canyons, for future generations. Once we build on that land, we’re never going to get it back. A followup discussion, titled "Why Redlands 2.0 — What can YOU do?" is scheduled for Wednesday, February 7, at 5:30pm in the Esri Auditorium. Registration, which opens one week prior to the talk, is required. For more information, see the Redlands Forum website.